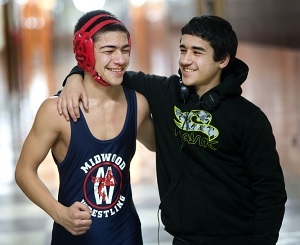 High school wrestlers and brothers Jahongir (left) and Jonibek Davronov. If you’ve been paying attention to recent world events, you may have noticed some inconsistencies in media coverage that hint at an agenda of maintaining a dangerously divisive narrative. From Australia to Europe, Africa to the Middle East, whenever a crime is committed by a Muslim or group of Muslims, the media never fails to highlight (if not celebrate, depending on where you choose to get your news) the religion of the perpetrator(s) and makes sure to expose any possible links they may have to one organized crime syndicate or another. Meanwhile, when a Muslim or group of Muslims is in the news for doing something good — whether it’s Kurds fighting ISIS in Syria or kids doing community service in Seattle — their religion is often not mentioned or highlighted in mainstream media reports. And it is certainly not celebrated. So it wasn’t surprising that a Feb. 13 New York Times article about the resurrection of high school wrestling in New York via an influx of talented teenagers from Uzbekistan contained no mention of religion, even though the story’s protagonists come from a country that is reportedly more than 95 percent Muslim. Zafar, one of the city’s top wrestlers, has brightened his team’s fortunes. But what is most remarkable is that while he stands out among peers for his skill, he no longer does for his background. When he started at Brooklyn International he was one of only three Uzbeks at the school, but Uzbeks are becoming perhaps the defining force in Brooklyn wrestling. Brooklyn International now has 20 Uzbeks among its 350 students, and 10 of them are on the wrestling team, with more to come. At least nine high schools in Brooklyn and one in Queens have Uzbek immigrants on their teams. Those with the most Uzbeks — New Utrecht, Midwood, Madison, Franklin Delano Roosevelt and Forest Hills — have been among the top teams in their divisions. Midwood had a record of 3-4 in 2012, its last year with no Uzbeks, but has been 20-5 since. After the Soviet Union collapsed in the early 1990s, many high school teams drew Russians, Ukrainians and Poles, followed by immigrants fleeing conflict in the Balkans, helping to fuel an expansion of wrestling in the city. “The Uzbek influx has certainly brought a great deal of energy and excitement,” said Ken Bigley, the Public School Athletic League wrestling supervisor and the director of programming for Beat the Streets, a nonprofit group that promotes wrestling and provides supplies to the league. With a population of 30 million, Uzbekistan is not in the same league as wrestling powerhouses like Russia and Iran, but the sport has helped put it on the global stage. Since its first Olympics as an independent nation in 1994, Uzbekistan has won six gold medals, and four have been in wrestling. Fight sports in general are hugely important there: Uzbekistan has won 21 Olympic medals over all and 18 were for wrestling, boxing or judo. While it wouldn’t be right to assume each one of the wrestlers featured in the article is Muslim, given the religious demographics of Uzbekistan, it is at least sensible to assume some of them practice Islam. I don’t want to believe there’s a concerted media conspiracy to vilify Muslims by highlighting their misdeeds and downplaying their good deeds. But the aforementioned inconsistencies are hard to ignore. And in New York City — where a loud segment of the population is so ignorant about Islam that they opposed an Islamic community center being built near the 9/11 site — wouldn’t you think the public could benefit from the area’s most respected newspaper running positive portrayals of the Muslims who live among them? But even when this article describes the political and economic conditions responsible for recent immigration from Uzbekistan, it doesn’t mention that the country is mostly Muslim. The only clue comes when it says Farhod Sulton, the president of the Vatandosh Uzbek-American Federation, runs a mosque. Annoying as it is that the New York Times missed the mark here, for now we can at least look at the positives. This is an otherwise great story about a great group of young men who are excelling in sports and in school (presumably, as high school athletes have to maintain a certain GPA to remain eligible to compete) and giving themselves a chance to take advantage of the opportunities their families were searching for when they originally moved from Uzbekistan to the U.S. And they’re doing it by continuing a family tradition of combat sport competition.